Concrete ships sound like an April fools joke, but in fact there were many examples built in the last hundred and fifty years. Most were built during times of war when steel and timber supplies were scarce. The disadvantages of concrete boats are many; they are heavier, more costly to construct and as the walls are thicker their carrying capacity is much less. The advantages are that much less steel is required. The fact that they are heavy, robust and difficult to dispose of means that although they are no longer sailing the seas, a lot of the ships built still survive as breakwaters. The most famous example of concrete ships were the British built mulberry harbours. These were built during the Second World War and towed to Normandy for use as temporary breakwaters and pontoons as part of the invasion of occupied France. They are still visible today off the Normandy coast. 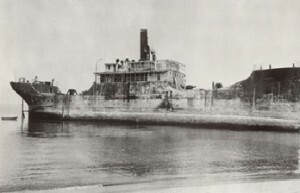 Other less well known concrete ships were built and used by the British and the US Navy to transport troops and supplies during the Atlantic and Pacific campaigns in the same war. I would be interested to know, if attacked, how well they resisted damage from bombs or torpedoes compared with steel ships. I suspect they would be more resistant to damage, but have been unable to find any evidence for this. The first known concrete ship was featured in the 1855 World’s Fair in France and constructed by Joseph Lambot in Southern France in 1848. 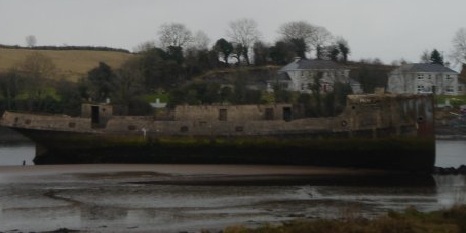 In Ireland the SS Creteboom lies unused in the river Moy near Ballina, County Mayo. It was one of twelve ships constructed during the First World War for use as tug boats, to tow barges filled with supplies of Iron Ore from Northern Spain to Britain. It was built by the Wear Concrete Building Company in England in 1919. However the war ended before the boat was finally launched. The ship was never used commercially and was abandoned in the River Moy in 1930’s. Plans to use her as a sand stop never materialised. There are many concrete ships still in use as breakwaters in Britain. But one of the sister ships of the SS Creteboom, above, is still visible and lies in the River Wear in Sunderland, England. During the Second World War it was damaged in an air raid and later sank as it was being towed up river. The largest concrete ship that is still afloat is the 120m long and 6,000 tonne S.S. Peralta. This ship was built as an oil tanker by the San Francisco Shipbuilding Company in the United States and launched in 1921. The ship is one of ten concrete ships used as a floating breakwater to protect a log storage pond on the Powell River in British Columbia, Canada. There is no longer any large scale concrete ship building taking place. Although concrete barges are still being built in Europe for house boats and there are some specialist one off concrete yachts. However this may change in the future. Concrete technology has greatly improved and is becoming more suitable for concrete ship manufacture. For instance specialist high strength concrete is now available, and when used with corrosion resistant fibres this would allow a thiner walls, thus reducing the disadvantages of concrete ships (i.e. heavy and less capacity). Alternatively light weight concrete could be used to reduce the ship weight. Therefore there is a possibility that concrete ships will again be built in the future, especially if steel prices continue to rise. Thanks. If you have any, yes please e-mail them to me and i can add to the article. 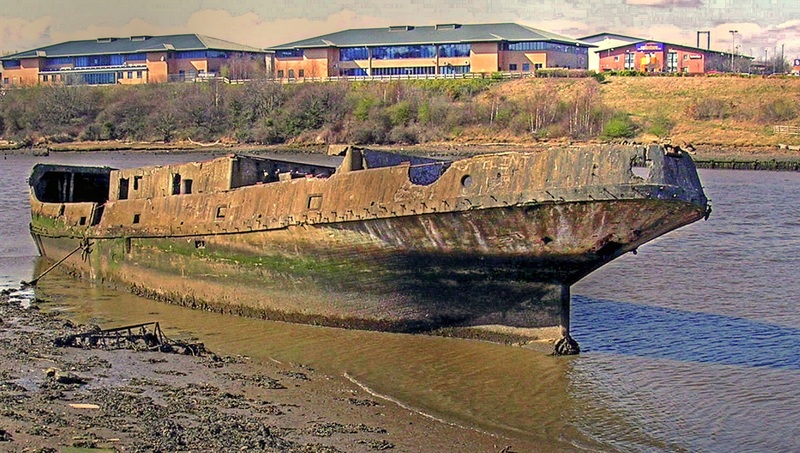 I would love to get one of these abandoned concrete boats back on the water and get it back in use again, the fact it was slow on the water would not matter as a part of history would be back afloat again. The CRETEBOOM was one of 12 Concrete Steam Tugs built at the end of WW I. Six (including both the CRETEBOOM and the CRETERGAFF) were built by JOHN VER MEHR in Shoreham -By-Sea, West Sussex. Two were built at Amble and one was built in Aberdeen. The 12th Tug the CRETERGAFF being sold to S.A.Portus of Garston.He used her to work barges of newsprint over to the Isle of Man from Liverpool. He lost the contract due to him attending a vessel in distress in 1936. She was eventually sold to the Irisk Oil & Cake Co at Drogheda being used as a grain storage barge being renamed LADY BOYNE During “The Emergancy”(as WW II was known as in the Irish Free State ) it was planned to use her in the event of an invasion as a “Block Ship” at the mouth of the River Boyne. Eventually she was acquired by a Mr Monelley who had her refurbished and returned to her original name CRETERGAFF after which she was towed by Captain Stephen Carter of Laxey Towage to The Carlingford Yacht Club were she is now the Club House. Also here in use as part of the Yacht Club Breakwater is the concrete barge CRETEFIELD which was oneof the barges built by T.J .Thompson of Warrenpoint on the north side of Carlingford Lough! The CRETEBOOM was sold to the South Stockton Shipbraking Co for the recovery of her engine, boilers and equipment (which were then re used by Steleph & Leighton in new metal hulls). The hull was then sold to the River Moy Commissioners for use as part of a scheme to control the channel of the River Moy. This proved to be a failure and she remains in the river today after a failed plan in the 1970’s to get her up to the Quay at Blaina. The third surviving Tug the CRETEHAWSER is as you note dumped in the RIver Wear near Sunderland. Along with the Concrete Motor Schooner VIOLETTE which is in use as a breakwater at Wilton Marine , Cliffe-Att-Hoo, Kent The “Creteships” are the last surviving WW I Emergency vessels surviving in the UK. It should read Stelp and Leighton, not steleph. light weight concrete and so on. The project real for the building and operation of any self-propelled concrete ships and vessels. Currently I’m looking for funding and partners to continue the work to continue the work.